South on Highway 395 which comes into Spokane on Division Street. Take Division south to Sharp Avenue. Right at Sharp...Sharp to Atlantic. Then turn left on to Atlantic...Atlantic to Boone. Turn right on to Boone... Boone to Howard. Turn right onto Howard... Howard to Arena. North on Highway 195 to Interstate 90. East on Interstate 90 to the Maple Street Exit. Turn Right on Maple.... Maple to Boone. Turn Right onto Boone... Boone to Howard. Turn Right onto Howard... Howard to the Arena. Turn Left onto Maple.... Maple to Boone Avenue. Turn Right onto Boone... Boone to Howard Street. West on Interstate 90 to the Division Street Exit. Division splits into Ruby Street... Ruby to Sharp Avenue. Turn Left on Sharp... Sharp to Atlantic Street. Turn Left on Atlantic. Atlantic to Boone. Turn Right on Boone... Boone to Howard. Left on Howard... Howard to the Arena. West on Interstate 90 to the Maple Street Exit. Turn Right on Maple.... Maple to Boone Avenue. Turn Right on Boone.... Boone to Lincoln Street. Turn Right on Lincoln.... Lincoln to Mallon Avenue. Parking Lot between the 820 and 720 Mallon buildings. Turn Left on Maple.... Maple to Boone Avenue. Turn Left on Mallon.... Mallon to the Service Yard. *Guests will be notified of the parking rate each event via KNOW BEFORE YOU GO emails and social media postings. 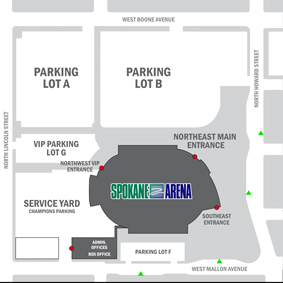 No overnight parking is permitted unless approved by Arena Management. The passing out of flyers or selling of merchandise is strictly prohibited by outside groups or individuals without the permission of Arena Management. No consumption of alcoholic beverages is permitted in the parking lots. If you are considering tailgating during a game day, please refer to our policies page. Bus and limousine parking as well as shuttle bus drop-offs from senior centers, retirement homes, and tour groups are easily accommodated for any event. Please call Diamond Parking at 509.747.8144 to make arrangements.